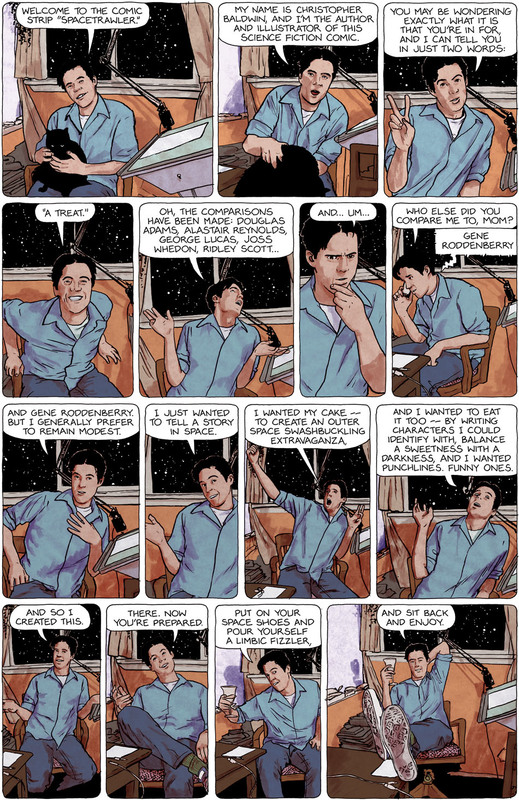 This strip is the “introduction” to the first Spacetrawler book. That is our cat Cadfael and myself. My girlfriend did an awesome job taking the reference photos for me. We had lots of fun hamming it up. 🙂 (Monday will return with the beginning of Specatrawler book #2). Book #1 was indeed shipped off to the printer on Monday, as planned. Possibly by this coming Monday I’ll have a time estimate from the printer as to when it will be complete. Oh, and when I do the webpage redesign, this strip will probably be moved appropriately to the beginning of the archive. Thanks for the awesome link from 2ce(Deuce), also thank you to whoever edited into my Wikipedia biography that I’m doing Spacetrawler! I can think of a few drinks strong enough that you won’t remember them the next day, but what exactly should go into a Limbic Fizz? ahhh. this strip is so you. ha! So does Cadfael solve murders for you? In the middle ages? Just confirms my belief that you can always depend on a man in Chuck-Ts to deliver the goods. @Jordan, I have no idea what goes into the limbic fizzler, except a little stardust and a little won’t-forget-me-not. Oh, and I shoulda’ linked, the limbic fizzler also appeared in this strip (panel 5) (and is, of course, on the shirt). @Jeff, voted one of the best products to come out of the US ever. If you see images of today’s strip on comixed.com…. uh… I didn’t do it. Loving the comic, Thanks. Ha, man this is GREAT Chris! I love it. What a neat idea for the book, and you did an amazing job drawing yourself. I could never do that. Really looking forward to the first book, can’t wait to get my grubby hands on it, and read it over a good Fizzler. @Jordan, you didn’t remember the recipe the other 9 times I made them for you! (And don’t blame me for your waking up in bed with your tax auditor … in Alaska … twice.) So just kick back and enjoy the strip. This is awesome! You totally nailed the soles of your Converses. Nicely done! Random Frog Children strips with a touch of Tom Goes to the Mayor. But in Space. Which makes it way cool. I’ve imagined a Limbic Fizzler as something not too sweet, tequila-drunk dangerous and somewhat caustic. Nevertheless, the idea sounds good and I’d try one. So glad this strip will be in the book. Looking forward to buying it. Behold the man who managed to have his cake and eat it too! I think that calls for a “great success”, especially considered that this cake is fiction. But unlike everyone else, I didn’t much care for this strip. I get a bit of an ‘uncanny valley’ vibe from it, where some aspects look too real while other aspects don’t look nearly real enough. It’s tearing my perception apart! @Miod, even more-so, have you read my short comic I Am Hans Krunkel? @Christopher: yes, but this one does not start with you having a cat on your knees. The cat matters a lot. @Miod, I’ll let Cadfael know. He’ll be very pleased. Excellent intro. I haven’t read the strip yet (was a fan of Bruno though) but will go back and catch up before the next story. Glad I found it Chris! Great intro for your book, but equally great message to you fans between books. I can’t wait for the next one and great job making book 1. It’s been a pleasure, and I hope to one day have as much fun as you telling a story. Keep up the fantastic work. Thanks, @Jim (also, check out my comic I did between the two, Little Dee). And Ellie on Planet X is lovely, I just read a bunch and look forward to reading the whole archive (and just added it to my sci-fi links). Thanks Christopher! I love Little Dee. If you happen to be lucky enough to live near http://www.afktavern.com you can get a Limbic Fizzler of your own. Otherwise, this is off their drink menu. Limbic Fizzler: Absolut Pear and Ginger Ale with a sugar cube. Ima keep reading, and I’ll spread the word that was spread to me. After Bruno and Little Dee I got busy and dropped reading a lot of comics. So I’ve been saving this one. So far, so wonderful. Love your sense of the absurd. It rocks! i am on my way from the start to the current strip and thought i’d stop by and tell you: “You’re awesome!”. well, not you in particular, we’ve never met, but your story and writing and drawing are stunning! PS: wtf? this is a story, a good one, too… why do you have a “random” button?!? Uhm…wow. No comments on this particular strip. Figured I’d keep it from being too lonely up in here. I’m enjoying your comic so far. Started at the beginning and have made it this far. Great! Now I look like a noob! It SAID there were no comments on this particular strip. It LIED! Aw well, whatchagonnado?